Friends! It is often said that “love comes and goes but friends are here to stay“. Yet, how many people have we called friends only to see them disappear into the vast unknown? If you are like most of us, and me, they are too numerous to count. People we called friends, sometimes best friends, in our childhood, in high school and college, in whatever team sport we played, at work, at the local bar, etc. Some of us are lucky, very lucky, to still have a few of these people in our lives. Friends are the people who saw us through our joys and sorrows. The people who were there to celebrate our victories and help forget our defeats. They were there to be happy with and for us when we told them about falling in love. They were there to wipe our tears, lend a shoulder, or buy us a pint of Ben & Jerry’s ice cream or a beer when we fell out of love. Friends see the pain in our eyes when everyone else sees our smile. Friends hear the sadness in our voice while everyone else hears us say: “I’m fine”. And we were there for them in the same ways under the same circumstances. We sometimes have dreamed similar dreams. They get us and we get them. Friends! We are comfortable with them, like an old pair of moccasins, an old sweater or even our favorite chair. It fits us. We cherish their presence and their laughter. Friends can tell us go to hell because they have our best intentions at heart. 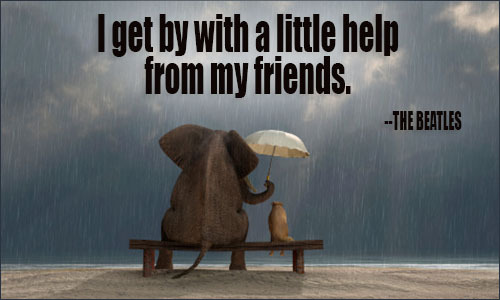 Friends drop whatever it is they’re doing when we absolutely need them to be there for us. Friends don’t judge us by the size of our bank account, the car we drive, or our job title. If you are like most of us, the older you get, the more difficult it seems it is to keep friends. Friends get married, they have kids, they have jobs which stresses them out, they move out of town and sometimes out of state. We too have our shares of issues. We get fired or resign. Our partner cheats on us or decides to end the relationship for reasons we have no clue about. Our four-legged companion dies. Our parents get sick. A million and one things that are part of our lives as we age. It is also said that it is better to have an enemy who honestly says s/he hates us, than a friend who’s putting us down secretly. Remember as we choose our friends, to choose the strong ones. Remember also that strength can be used to push us down, or to raise us up. Choose wisely. I choose my friends also by the friends they keep. Are they honorable? What are their ethics? Do they see their glass as 1/2 full or 1/2 empty? Do they exude kindness through their strengths? Do they walk their talk, or do they cave when the going gets tough? Will they challenge and help me to be better than I am, or try to take me down to a lower level? I am both honored and privileged to have a few friends to whom I would trust my life. In fact, in a few instances, I have. We often disagree on a variety of subject matters, but we’ve always been there for another … and I think we always will. As I age, I find myself appreciating my friends ever more and I take the time to tell them. Some of my friends are men who are still hesitant to show emotion other than by grunting and slapping each other’s back silly. I accept that, but I still tell them that I love them and that I am honored and privileged to be their friend. By the way, perhaps it goes without saying but… a friend is unlikely to be someone who liked you on Facebook, or some other social media! Hi Alchemyoftheheartandsoul. Great, even if long name, because you are an alchemist of both helping us navigate the shoals of relationship from the spiritual side. As an adult female, I find it so interesting to realize who has come and gone (like, “for good”) out of my life, vs those who float in and out, sometimes with many years in-between. For example, I had 2 highschool into young woman era friends who disappeared. Just this past year, we have made contact once again. In one case this was because of the death of parents and in another, it was because of that wonderful tool called Facebook. I even found the little boy who used to live across the street from me who I used to babysit! I wasn’t so interested in looking up people from my high school years. The girls had been quite hard on me and I really didn’t want to associate with them any more. Funny how time changes things. I went back to sing in the choir reunion in 2013. The snotty girls had turned into very caring 50-60 yr old women who had themselves, endured hardships and bumps along the way. Many of us reconnected via FB and continue to share our adult lives that way. My husband however (Sir Harry of Essex), is completely different. HIS friendships ended when he was a young man. Those that might’ve crossed into our married life, chose to exit once they realized how well we had done in life or the expectation of not consuming questionable drugs any more. (heh) It was, after all, the 1980’s and the behaviors of the 70’s needed to change. These days, my husband has formed more deep friendships and caring relations with female friends of MINE whose husbands had left them, died, or the women who were going thru hardships. It’s been eye-opening to see him blossom in a more caring way for people who are suffering illnesses in their families or spouse, helpfulness when it comes to unpacking trunks when we are at picnic events and so forth. We can go to a town for an afternoon and the carpool we have is filled with female friends. It’s “Harry and his Harem.” We always laugh because we know we can count on that steady beat in our little group. I’ll have to send you the photo. Take care and keep us posted on your progress of making more meaningful friendships. Isn’t it great becoming more mature? Many hugs from Seattle, Lady Victoria. Thank you Lady Victoria. I’m please to read that Lord Harry is doing so well. When we allow ourselves to reflect upon the “bumps along the way”, we see that they smooth out the hard edges and outcroppings of our personality, and polish it so that our loving self remains. It’s a long road that most of us will only achieve in multiple lifetimes. Hope you’re staying warm and dry in Seattle!